After a stupid priority choice following an unfortunate combination of events, my 4m span Fliegerland Foka 4 plummeted vertically in the ground minus its port wing during the September 2018 BiGGS meet at St-Truiden (illustrated story here) https://www.rcgroups.com/forums/show...02&postcount=3. As Fliegerland was out of Foka kits for a minimum of 6 months I shopped around and had to go for a 5 meter span version which I ordered from JPV, a Normandy retired builder (he has no website). A few months before that, I saw a fellow BiGGS pilot maiden one at Pottes and the quality of flight and the model seemed very good. The weekend after the crash I got in touch with the builder and within days I order a pretty much prefabricated kit consisting of a molded fuselage, styro wings with Samba (Abachi type) sheeting over 100gr glass-fibre ready for finish, ailerons and 400mm spoilers installed. Wings and tail rigging made, wheel installed, clear canopy without frame included. Removable rudder with built-in servo installed. That is a lot of work this amateur but very capable builder delivers (halfway via a trucker) for about €1500, after 10 weeks of intense labor. Basic fuselage and foam wing cores can be ordered for less than 500 euro if desired (or for repairs). How can you squeeze a person of normal height and shoulders into that tiny cockpit? In 1952 designer Ernest Oscar Tips started designing his diminutive T66 in the Fairey aircraft factory in Gosselies Belgium. As the Hawker Hunter license production ran down he started building prototype OO-NIP that was testflown with open cockpit on 2 december 1957 by Belgium’s famous test pilot Bernard Neefs. In 1959 production started on the closed canopy Mk2 that were powered by a 45hp Volkswagen, Stamo or Hepu engines with exposed cylinder heads, 64 were built till 1962 (+78 kits delivered). Because Fairey started producing the F104 Starfighter, the Nipper production was then taken over by Cobelavia that produced 18 Rollason cowled-engine Mk3 Nippers in a hangar in Kortessem (just a few km from my town and model airfield) till 1966. From then on production of complete aircraft (and kits) was transferred to the U.K. Slingsby built them till in 1971 the Donington based firm went bankrupt (after producing 32 complete aircraft). Later kit produced variants even boosted a 85hp Jabiru engine. Nowadays many still are airworthy in the UK, Belgium and the Netherlands. Purchased unfinished on a second-hand website in 2015, that 1988 Rödel kit had been lying dormant in its box and only assembled after 2010 by a new owner who didn’t complete it. That very rare standoff scale 1:5 model was larger than I had in mind (2m11 wingspan) and was too heavy for the AXI 4163/20 that I had purchased for a conversion of a 1:6 PC9 into a PC7. I sold the PC9 but this PC7 model still had no engine mount nor flaps, aileron servos were missing, and too long legged brand-less electrical retracts with dubious electro brakes installed. Upon inspection I saw that the assembly quality was ok, the model being of period traditional build with balsa or Abachi planking over a foam core for most surfaces. Although it weighed only 5,5kg as acquired, everything was made of strong quality wood with the fuselage painted and wings in Solarcover. White being a good base color for the yellow I was going to apply over it, we quickly agreed on an acceptable price before I loaded the model in my camper. Back home I had to rearrange the hobby room to stock that relatively large model, in the meantime I kept it in the living room in its partially finished Martini display team scheme. This was Jaques Bothelin's lead airplane HB-HMA in which I sat but never flew. The full size Pilatus PC7 peeling off after a pass at a Belgian open house in 2014. As I had the opportunity to fly aerobatics in this very aircraft I choose this very attractive scheme for my model. The model as acquired. Although it apears almost finished, many things are attached only by pieces of tape and lots of spaces are still devoid of their essential equipment, or were furnished with sub-standard stuff. Lots of carving and sanding before the square tips were turned into flowing angled warping on the intrados. Minimum space available for the flap center servo between hardwooden wing reinforcement and attach plate with holes for the screws that keep the wing tight to the fuselage for flight. Outer servo plates have more royal space. Old gear still in place, new gear at place it should have been on the model. Leg length and motor placement requires completely new attach points, also because wheel well position cannot be changed without massive weakening the wing structure. Last week of July 2017 BiGGS held its week-long gathering near the French border in Pottes/Celles. As I was the event coordinator I was kept busy all week and flew little. The almost constant force 3 to 4 crosswind also made things tricky and restricted the type of gliders that could be flown. Saturday had to be the highlight with the celebration of 40 years of the Waloon model association AAM with official speeches by representatives. Although I was reluctant I got a bit pushed to fly my historic Ka2b for the public event and assembled it for its 5th flight. This would be a short one because at only about 50 meters during the climb, the nylon snapped in the hook and I declared an emergency, joined a low downwind and settled down in a smooth landing. The crack in the port plywood planking under the horizontal stab was serious but did not continue further under the bottom of the fuselage. You can also see how the incidence angle of the stab was much too positive. With a clamp through a hole I cut in the stab bed area and the use of foam customized blocks inside and out, I was able to glue additional plywood inside whilst keeping the fuselage shape intact. After carefully extracting and flattening the cracked canopy acetate, it was used to make a cardboard pattern from which new clear acetate (shown with its blue protective paper) was cut as a replacement. In 1960 the Polish factory SZD made another throw at high performance gliding in an attempt to break the German hegemony in this domain. Although still of wooden monocoque construction, their radical Foka (seal) design was extremely pure and streamlined (laminar flow over wings and fuselage), still looking futuristic more than 50 years later. It not only looked good, but after a couple of months gained 3rd place in the 1960 standard class world championship. It later astonished the glider community when the 24 year old Jan Wroblewski entered such 15m Foka4 in the open class and became world champion during the 1965 UK held championship, the one and only time a standard class glider won the open class title, and this in an aerobatic capable (+6 -3G) production glider. Production of the SZD 24 Foka4 ended in 1968 after 204 gliders, of which only 137 found an export customer. It acquired 7 world records with a 1:34 glide ratio, a maximum takeoff weight of 322kg and an initial speed range between 62 and 250km/h. Some are still flying nowadays but are limited in speed to 160km/h and G’s after some disastrous in-flight structural wing breakups. At the end of the 2017 flying season I stumbled upon following advertisement on the popular German RC website. The white paint had been applied after the German registration marks had been applied over the bare fuselage with 2K orange paint, this was the result after removal of the lettering ! Classic method of figuring out the MAC of a tapering wing, by joining (yellow line) the extending chord each side out of the existing one and noting the intersection with the half chord (white one). In 1968 shortly after becoming solo on a towed Ka4 Rhönlerche, I took place in the frontseat of a Belgian Air Cadets Schleicher Ka2 Rhönschwalbe glider for my first winch launch. By that time their surviving 1955 acquired Ka2's weren't used much anymore and I was glad to have had that ride in one of the 75 Ka2b airframes that were produced between 1955 and 1957. This also explains why the Ka2b figured on my dreamlist of model gliders since years, especially when I found out that a traditional wooden kit was available from Schneider Models in scale 1:3. The size of that model, 5m33 span and a 2m75 fuselage length was as attractive as scary to me. The kit consists of only the plans and some precut wood and canopy mold, building it would require the living room table to be neutralized during about two winters because the wings and fuselage are too long for my hobby room. The existence of Ka2b OO-SZD on the Belgian register, after half a century still wearing extremely attractive SABENA (former Belgian World Airlines) colors, was also a strong incentive to “ever” possess and fly a Ka2b model in this scheme. Very attractive 1953 Ka2b glider pictured in airworthy condition in 2008 somewhere in Belgium. It spent most of its life in the Sabena aeroclub, created early sixties by Sabena airline pilots who enjoyed stick time during their free weekends. The model as advertized during summer 2016 on the German RC Network for sale site. Note the tiny electro motor shaft sticking out of the nose (without prop hub) and the owner's puppet that was not part of the deal. The long wings and fuselage rested on the dashboard, right forward and rear seats plus lugage cover for the travel. Even with the wings in sandwich and the fuselage next to it the taper was such that it almost needed the full width at the back. Using the only available straight length blocked any view through the inside rearview and outside right mirror. The model survived this 650km trip back without a scratch. The only (accessible) barely long enough wall along which I can work on the model and permanently stock it in my dining room. The Blanik to the left is only 2m18 long. No way to hide my hobby to the visitors anymore. Trailing edges developped big waves between the still straight ribs along the inner third of both wings, the result of using excessive heat on the Oratex? Electronics and antennas were convenently attached between the wing attachments for easy access. A scale cover plate over the wing makes them invisible when assembled. Instructor's instrument panel looks very scale with correct period instruments. 1) the search for a Twin II and a first analysis. After having neglected the Belgian Air Cadets for decades, a friend of mine suggested I came along with my models for a courtesy visit. Instructors and cadets were very interested and they offered me some time and space to perform demonstrations on the vast Nato reserve airfield of Weelde. An even better deal was that they offered me a couple of winch launches in a Twin Astir, their standard trainer. I try to renew that visit every summer and got the envy to make a model of a Twin I flew in. Because theirs were purchased secondhand on the German market, not 2 of them are painted the same. For ease of seeing it in the air, I opted for the PL91 which in 2013 still sported all-orange flight controls and wingtips. The full size Twin Astir II in which I had a winch launch a couple of summers ago at Weelde airfield. Simple but colorful large orange panels are very visible for orientation even for an airborne model as seen from the ground. The evening it was delivered I noted many more shortcomings than expected, both structurally and cosmetically. Obtaining a new canopy for this 1980 model was impossible. I put the model aside for 2 years before I had the courage to start the restoration. The underside of the vertical stab was a mess of unfinished polyester repair and remains of white cover material. Former nose weights were removed and lay on top. Red tape loosely over former sidemounted towcable orifice to allow PU glue to fill. Reverse mounted nosehook solidly PU'ed all around the nose orifice, control rod to the left towards existing servo. Interior view showing changed elevator servo on old bracket, reinforced nosewheel bracket, tub with front pilot buste that had to be modified, as well as the instrument pedestals. Although I had made up my mind not to buy any other model before I finished all the ones awaiting in the attic, my eyes popped when I saw the picture of an ultra-rare 2m80 span Fournier RF5b Sperber advertised for a reasonable price on a well-known German RC forum. Besides having met an old friend who bought a full size RF5 and promised me a ride in 2016, I also remembered how often there had been suitable soaring weather but nobody to tow during the summer months. I had hoped to fill that void with the foam Hype DG1001M with retractable engine, but it proved too much of a toy and after selling it I was on the lookout for a a suitable traditional material powered glider with a motor in the nose, preferably in the 3meter class that I also could use it on the slopes, and representative of a real motorglider. I immediately wrote a mail to the seller and he rapidly agreed to sell it to me although he had two more offers. Two days later I drove to Germany to pick it up amidst a cellar full of other models young and old. That is all the stuff I got for my money, a model with many alternative options to assemble, but really not that attractive. Luckily I saw the potential for a real beauty in it. black rubber instrument panel protection glued under the canopy, shaved pilots in raised positions with the front one representing a young cadet and the instructor in the back a reserve retired air force pilot wearing period haircut over his ears. foam glued to the underside of the pilot busts and arms but awaiting final shaping and filling. Beards lightly sanded and filled to eliminate any traces of them. Clear cleaned and reshaped canopy ready, tailplanes being prepared for Oracover application. June 2011 I purchased a secondhand 1400mm FMS Spitfire from a club member who had only flown it once and found it much too challenging for him. I wasn’t a hero either at that time, but I definitely didn’t want to miss this opportunity because on the scrapheap of the clubhouse I had seen an almost complete but total loss identical model for takes. Having performed aerobatics in the back seat of the real PV202 (G-TRIX) Spitfire two-seater during the Oostmalle warbird meet of 1993, I wanted to fly that as a model as well. A flight by an RC shop owner confirmed it was very unstable in pitch and dropped a wing during the flare. Inspecting the model I noted the elevator to be anything but rigid. The foam couldn’t handle the torsion caused by the control horn only on the starboard side, and the aerodynamically correct outboard balance sections twisted much too easily, thus exaggerating any elevator input and making the model very twitchy in pitch. I resolved the problem by cutting off those outboard sections from the elevator and gluing them with some carbon rods to the fixed horizontal stabilizer surfaces. It thus didn’t alter the overall shape, but drastically reduced the torsional forces on and between both elevator halves. The front removable canopy and half of the middle part rests on top of the reversed former aft part of the fixed back canopy. Old and new balanced props ready for installation on the lead ballasted nose, plastic assemblies fit tight and well. This charismatic model looks very scale and the twin cockpit version sets it apart from the hundreds of other out of the box Spitfire models from various brands that can be seen on the fields nowadays. Having had a ride in the back seat of the leader of the Frecce Tricolori during the 1984 Sanicole airshow, the FlyFly/TopGun 90mm EDF Aeromacchi 339 model had been on my wish list for some time. I saw somebody else in the club fly this relatively large but seemingly docile model , and when I decided to get rid of my smaller EDF’s and standardize on 90mm fan models, I immediately thought of this as a proficiency trainer. End of June 2015 I saw a completed yet unflown one for sale on the secondhand market and purchased it for 200 euro. The assembly and finish quality was atrocious, but the value was the Typhoon HET EDF 650-58-1760 Motor with an 11 blade TAFT fan, the rest was for the model with servos and replacement electric retracts and battery. I figured all those items later could be used on my still dormant FlyFly F100 Super Sabre as well. The first detailed inspection at home did not make me happy. Servos seemed to be the cheapest HK variety, summarily glued into the recesses and covered by painted-over sticky tape. The reliability didn’t bother me too much because there were separate servos for each elevator and aileron, thereby allowing for half the control in pitch or roll even after a servo failure. The drag produced by the thick Christmas decoration letters with rough sparkles would have been enormous, and these were quickly peeled off. Why did he use such very thick and draggy letters? What kind of hinge tape is that? Clearly handpainted everywhere. The 100Amps between the 6S battery and ESC were supposed to pass through 40Amp rated green Multiplex plugs ! Nosewheel room cutout was very rough. I added a wooden plate to keep the fuselage from sagging under load at the wing junction. Pylon tanks were removed for drag reduction. Newly installed electrics clockwise: FrSky X8R receiver, additional receiver battery for backup through diode, variometer as telemetry signal converter for a FAS100 power sensor, battery immobilized and connected via EC5 plugs. 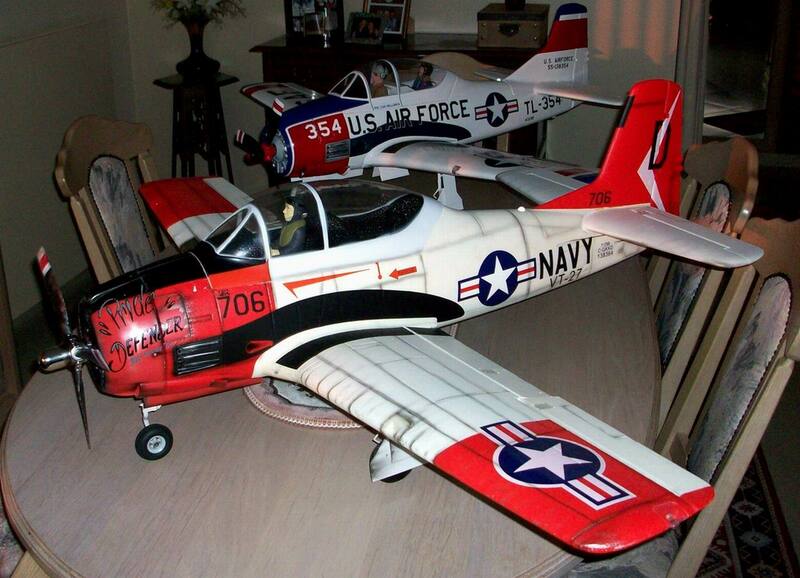 When I started flying indoor during the winter of 2013 I had no envy to buy the traditional aerobatic generic Depron models that are so popular. My penchant for scale led me to buy a micro Spitfire from Parkzone. Changing the delivered UK colored model into the Belgian markings MH434 like it flew during summer 1991, added much more weight and caused the minimum airspeed to increase so much that it became difficult to fly in our limited dimension sports hall, its small size also made it difficult for me to estimate its real distance from the walls. An internet search for a more suitable model made me search for a larger biplane. It thus became the E-flite Nieuport 17 which I ever dreamed of building as a full-size replica and for which I ordered the Redfern plans in 1983. I never realized that dream (due to the lack of suitable engine at a reasonable price) but decided to at least fly a model of it in my chosen finish of a Nieuport 23 flown by the famous pilot Edmond Thieffry during the first world war. Removal of the colors and decorations on the original model caused so much damage that I had to use too much filler on the tail, necessitating additional weight in the nose, and the additional paint coats and decorations didn’t help keep the weight down. My first Nieuport was a 17 converted and painted to represent a Belgian operated fighter of the first world war. Problems with weight, wing incidence and dihedral caused it to be a tricky and poor performer, but I liked the looks. First fitting of the node 0,8mm torque rods, held in position by cutoff servo arm tips glued into small slots in the wing. Wheel parts or different origins were mated using non permanent glue to keep some elasticity in the assembly. When a wing of my ¼ scale Multiplex Ka6e structurally failed just after releasing from too fast a tow during an event in Wey (Germany) during spring 2014, my scale marvel came down vertically from 400meter and was only good for the scrapheap. Either I had to build another model, but that would leave me without large-glider scale-weekends during summer, or I had to buy a ready-to-fly secondhand scale model. I opted for the latter, and after missing a 5m Lunak by a matter of hours (sold by a German to another Belgian), I choose for a rarely used ¼ scale Heiko Baumgärtner Blanik http://www.hb-modellbau.de/html/blanik.html that had been for sale for a while in Switzerland, but not advertised much on popular web places. After a few mails with the seller, I borrowed my dad’s new station wagon, and left early for a 1400km non-stop up and down trip (in one day) to pick it up. I found his house just after noon of the third of July, and after a coffee and chat whilst I ate my sandwiches, we went to the garage where he assembled the Blanik for me. Although similar in wingspan to my Ka6e, it looked twice as big, and was highly detailed and in superb condition. A 2006 picture of the full size Blanik in its Slovenian hangar, in the back a Polkarpov PO2 which might have towed it during the 60's. The result in July 2015, but it took a year of blood (yes, like everybody I sometimes cut myself during work) sweat and tears to get from the picture below to the one on top. I don't mind, like the result, and it keeps a retired aviator busy all year through. A week after getting a secondhand rare 30 year old WIK Twin Astir II glider, I stumbled on an advertisement for a quarter-scale Flair Ka8, fully assembled with servo’s and towhook, and advertised as “in good condition”. It was expensive, but a few hours after a half price bid I jokingly made, I got a mail that I could come and collect it. A few hours later, after having flown my Parkzone 2m25 Ka8b foamy to regain currency after the winter, I arrived at the seller’s home and spotted the assembled burgundy Ka8b in his open garage. It was love at first sight, the shape of that Ka8 nose was exactly scale, as was the front skid and the rear rubber skid. The wing had spoilers that extended on top and below the wing, as on the real glider. This model was still of traditional build, made of no less than 600 balsa parts (Flair manual predicts 400 assembly hours), and covered with fabric. Negative points were an atrocious outside towhook, a very roughly applied paintjob, and numerous “patchwork” repairs with inconsistent materials and colors all over the model. I could not imagine somebody building such a towhook anno 2008 on the outside of an 11 lbs scale glider. Internet picture of how another builder installed a correct pivoting nose-hook in the Flair Ka8 structure. How will I do the change without damaging the nose beyond aesthetic damage. A few weeks after the last post concerning my unrestored Multiplex Ka6e adjustment flights (with the pictures of the windhose mishap to the real glider), I got in touch with the photographer and the owner of the glider at the time of that mishap (2010). I got a good selection of more detailed pictures and was surprised about the extent of the damage. The detailed cockpit interior pictures proved an invaluable source of necessary data, and I also got the word the glider is lingering around “as is” in a hangar at St Hubert airfield, in the hands of a well-known Belgian restorer with no progress having been made at the end of 2013. Mid October I decided to ground my secondhand model after a total of 10 adjustment flights so I could start the restoration. After elaborated searches I had obtained pieces of yellow vinyl, fire-orange and cub-yellow Oracover, which all seemed to match the original colors rather well. The owner of the real Ka6e running a van modification shop, just mixed colors till they looked good, but didn’t take notes so getting them off the shelf with RAL numbers was not an option. Oracover also exists in the so called “scale” variety, which is completely opaque, but the catalogue warns this was obtained by a thin layer of aluminum which incidentally also tends to block RF signals towards internally mounted antennas. After reading and seeing some posts about finished Boeing 737 models from Windrider, I decided even if it didn’t fit exactly in my collection (I never was an airline buff), I had to have that model and finish it in some Belgian colors. I kind of liked the winglets and being a -700 I opted for a model of the well documented OO-JAR of the Belgian tour operator Jetair in its delivery configuration. Here you see a picture of the aircraft landing back at the Seattle Boeing factory after its maiden flight. Being christened with the Enjoy name on its nose seemed appropriate for an RC airliner. Straightening transport damage to the starboard aileron. Note although panel lines appear straight, most are curved and make cutting and vinyling much more time consuming. vinyled flap plus actuator, canoes, aileron and flap servo wire routing, and flap hinge positioning before vinyling on other wing. Not feeling much confident to maiden my heavy 3,7kg highly modified one, I bought a second hand stock 2,7kg V1 Trojan via internet. Although it had flown about 40 times from a grass field, that model was unscratched except for glued together broken main geardoor. The previous owner had kept it stock except for a reinforced nosegear and installation of a quality 60Amp ESC, and the addition of some weight in the tail. As we used the same batteries, and his Spectrum AR600 remained in the airframe, I couldn’t come any closer to a bind and fly model for a reasonable price, and according to his experiences, the CG was ok with the 4S4000 battery fully at the back of the tray. That Navy aircraft looked much more attractive as a stock one, due to detailed realistic weathering painstakingly applied by the previous owner. The results of a very nasty birdstrike, this is a solid metal aluminum cowling, not carbon stuff, but nevertheless has been totally wrecked after an impact at 200 knots. On the 13th of October 1969 when I got towed the by a Stampe SV4, for unknown reasons the cable snapped at the towship side about 100ft high. I released the remaining cable and landed with full spoilers after a sidestep onto the hard runway, just short of the field end. My logbook shows it was with PL54 and I flew the same airframe a month later during my precision landing tests to obtain my glider pilot license. PL54 also had extra orange colored ailerons so the choice as a model was a no brainer. kit pilot head only half the size of the too large tire, amended cockpit with period instrument panel after modification. 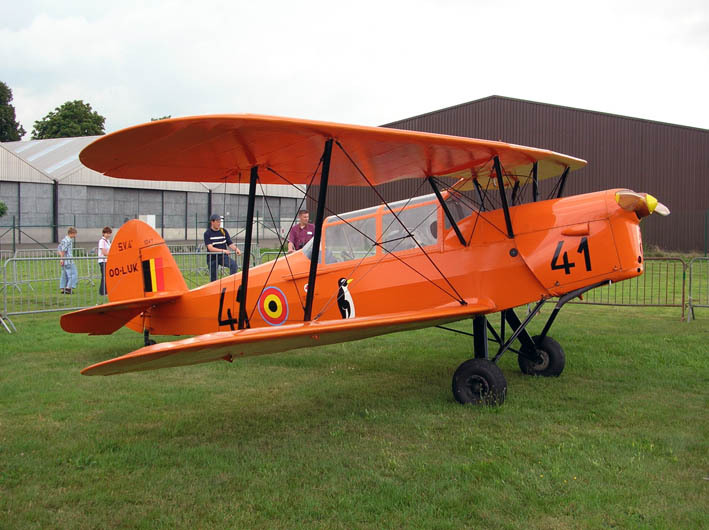 Since I had my first real aircraft ride during an open door in 1967, as passenger in a Belgian Air Force primary trainer Stampe and Vertongen SV4bis tail number V41, I had a strong penchant for that charismatic biplane. In 1972 those trainers were obsolete and got replaced by sleekly SF260M Marchetti trainers, and most were acquired by civilians. In 1982 V41 flew occasionally from the civilian airfield I used during weekends. It remained completely original except for sporting an additional civilian registration OO-LUK. I flew it many times over the years, and lately (2013) is in the hands of a former air force colleague pilot, having been restored to its former glory and being kept immaculate. Hatch raised to show batteries secured in position, and 90A ESC at an angle into the cool airstream. 12AWG EC5 paralel connections not plugged in yet for safety. Back pilot removed to expose old Multiplex servo's. Separate battery for receiver and servo's can be slid in through the bottom before the wing is attached. Cockpit pictures glued to their respective panels and magneto key for back seater on the tunnel. How do I stock and transport many models?